I headed into the Microsoft Technology Center Chicago on a chilly Tuesday after an early morning at an ADA 25th Anniversary program at Marianjoy Rehabilitation and Abilitylinks in the west suburbs. If I hadn’t been on a panel at the event, I’d have been at the kickoff of UCP’s Innovation Lab early, but this is a seminal year and I was flattered to be asked to participate. As it was, I rolled in around 11am and took stock of the slightly disheveled room – actually all three multi-purpose rooms (MPRs) – looking for friendly faces while trying to figure out at what stage of the lab I’d made my entrance. Full disclosure, this was my maiden exposure to a civic hack since my role at SPR had expanded to Director of Civic Engagement. I felt like a novice golfer playing his first actual round after practicing on the range for some time. I had read of hacks, supported hackathons, had SMEs introduce the community to ITKAN and could be kind of strategically articulate on the topic. But I was kidding myself. Until you actually participate in a civic hacking session – in this case Innovation Lab – you’re really a poser. My first awareness of the 2-day lab came from an email I received from Josef Scarantino, Manager of Strategic Partnerships at LifeLabs at UCP headquarters in Washington, DC. 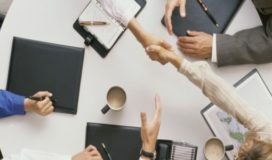 He was reaching out to potential supporters and partners in the Chicago area to strengthen the planned Innovation Lab in conjunction with SmartChicago Collaborative, its strategic partner for the event. He had reached out to me in my role with ITKAN – the professional development group that I’d co-founded in 2008 to support our candidates and professionals with disabilities in technology. The lab had been launched in 2014 in Washington, DC and Sydney, Australia as a civic tech effort to drive dialogue and innovation around principles of accessible design. At ITKAN we are always conscious of accessibility, whether in product design or content. The lab would be a great opportunity to encourage our members to immerse themselves in a civic tech effort on a national level. Since UCP hadn’t yet settled on a space for the lab, I made an introduction to Shelley Stern, Microsoft Chicago’s Director of Civic Engagement, to see whether the MTC Chicago had available space to host the event. Shelley was supportive – as always – and the MTC opened its 3-multi-purpose rooms to host the lab. On team Crazy Eights, I could see ITKAN members Steve Luker and Ron Busse engrossed in an ideation session with other team members – as it turned out – on Steve’s brainchild for a portable work desk. I tried to eavesdrop on another team, hoping to gain a better sense of where they were in the process…as well as some sense of what the process was. I headed over to another team where a facilitator was whiteboarding the process that they’d been through during the morning. I recognized a couple of the team members. Tifitri was spending the summer in Chicago as an intern with Commissioner Tamley and the Mayor’s Office for People with Disabilities (MOPD). Coming from Morocco, she worked for a government program developing greater access to services for people with disabilities. She had sat in on a meeting that we’d had with the commissioner a couple of weeks earlier to catch her up on ITKAN Advisory Team efforts. Another team member – Laurie, worked at Donka providing training in technology and assistive technology to persons with disabilities in DuPage County. Bonnie Koenig was leading the team in the whiteboarding session. Going International is her global consultancy to non-governmental organizations (NGOs), where she helps them create and implement strategies around their missions. It was evident that Bonnie was very comfortable in the role of facilitator for the group. Thirty years of global strategy experience and an M.A. in International Relations from Yale didn’t hurt. She invited me to join in and, before I knew it I was immersed in the Innovation Lab. The discussion surrounded what product or service the team wanted to develop. There was great energy – and more than a few disparate opinions – regarding the direction. I recognized that the make-up of the team…now my team…was very global, with members from several nations as well as both coasts and the Chicago area. Our team was also made up of diverse backgrounds, including a masters candidate and another PhD in engineering doing work at the Rehabilitation Institute of Chicago (RIC). The lab was being held in conjunction with UCP’s national meeting in Chicago, driving some great participation. We adopted the name Team Global Access and decided to work on an aggregating application that would enable you to take advantage of a global repository of data in the cloud, real-time language translation, and trusted advisors home and abroad through your smartphone. Whether your challenge was finding a repair shop for a flat on your wheelchair or finding a calm or safe space to reduce your anxiety while traveling, our “U Access” application – for Universal Access, would be your traveling concierge with a heart. One of the key features was to be the ability for the app to catalog a group of trusted advisors whom you could call on to support your needs and provide their knowledge, whether logistical, professional or social – to enable you to travel smoothly around the corner or around the globe. We recognized that the presence of a disability can create greater travel challenges, and having a friend with experience overcoming the challenge who can guide you can make all the difference. Additionally, your output or answer could be in several forms – oral, text or some haptic response – to accommodate as many challenges as possible. We closed out the afternoon with a pretty solid sense of U Access as well as its features, benefits and differentiators. Day Two at InnoLab – Judgement Day! Now fully immersed in the process and my team, I was in the room early on day two, hoping to redeem myself for my late arrival on day one of the lab. Christopher Whitaker – well respected Chicago civic tech personality – kicked the day off with an agenda overview and the teams quickly regrouped to put flesh to bone on their accessible concepts. 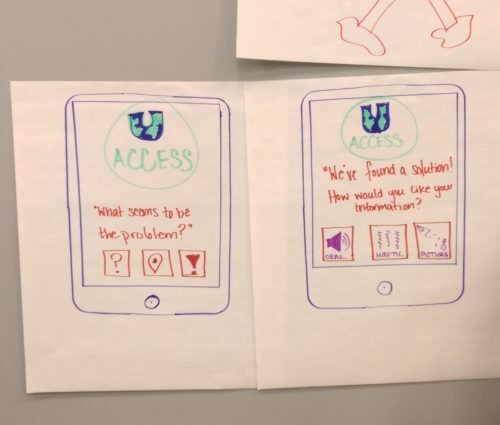 Other concepts included incorporating sensor technology with clothing to support more independent living for people with cognitive disabilities and a smartphone app to link to your shopping cart at the grocery store to prompt you when you near an item on your list. Teams focused on dry runs of their presentations to the judges, acutely aware that 10 minutes elapsed quickly when trying to introduce a novel product or service to an uninitiated audience. I found the process that Team Global Access experienced over the two days to be very rewarding as we explored one another’s strengths and passions. Bonnie was masterful in engaging the entire team and gaining the group’s support for our direction, suggesting a potential order in which we might present U Access to the judges and other teams. Once we’d established our delivery we ran through it a few times, more confident each time through. Then the judging began. Team after team headed up to wow the judges with their presentations, all surprisingly poised considering the challenge. One team had even created a web site with fairly expansive content to support their product! A couple of others had cobbled together a working…or somewhat working, prototype. 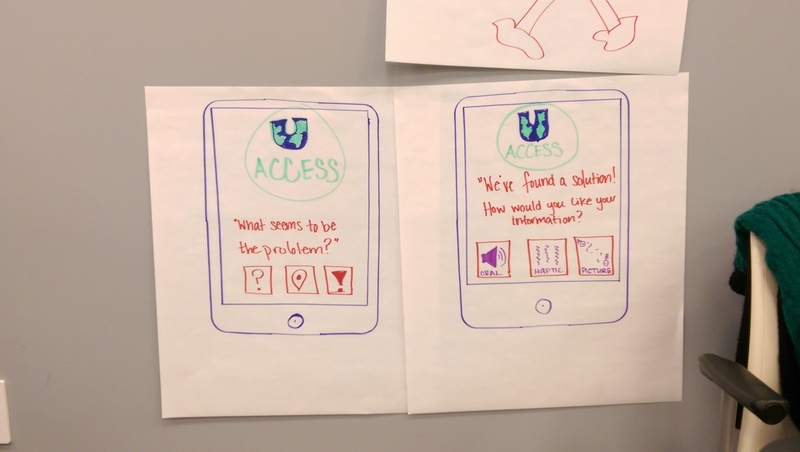 Our quaint storyboarding of U Access – the Global Concierge, was seeming less impressive as we waited anxiously for our shot at the judges. We filed up to the center of the large room, past a couple of the other relieved teams who had already presented, and began our presentation. Before I knew it we were answering a few obligatory questions from the judges, accepting modest acknowledgement from the audience, and heading back to our “office” space, equally proud and relieved – sentiments that I expect everyone in the room experienced by the end of the afternoon. The judges selection for most marketable product was, as I recall, the system of sensors integrated into clothing to support more community independence by people with cognitive and learning challenges. A laudable concept to be sure. The fan favorite – voted on by each of the teams – was Team Crazy 8’s portable work surface/desk. I felt an unearned sense of pride in that, being that a couple of ITKAN members were represented on the team. Go ITKAN! At the end of the 2-day Innovation Lab I was exhausted, but also gratified that I had spent the time immersed in both a creative and supportive team and larger collective in a very demanding process. 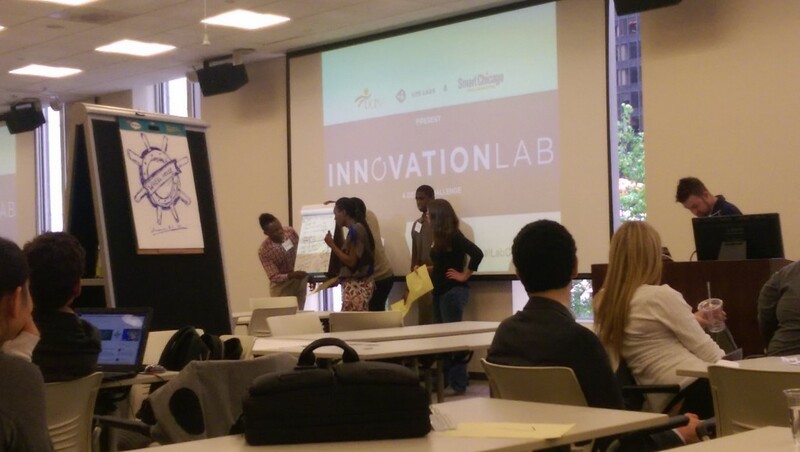 The UCP/Smart Chicago Collaborative Inno Lab was an experience that I’ll long remember…at least until next year. Look out judges, Team Global Access will be back! Prev UCP and Smart Chicago Team up at 2-day Innovation Lab!